How do we know what will impact our organization in 10 years? Business futurists are consulted to predict global, social and economic Megatrends and what savvy organizations need to do to complete. CEO's focus on how these trends will impact the long-term success of the organization - and your employee population is at the top of the list. HR departments have to get ahead of the megatrends that are facing their businesses and anticipate trends that will impact employees. In this webinar, we’ll explore the top megatrends CEO's are watching for the next 10 years and determine how you can implement these to focus your human resources initiatives. Don't miss this opportunity to get ahead of the curve and bring the latest thought leadership to your organization. HR Departments of One are pulled in different directions every day. Staying on top of the HR function can be complex enough, and compliance must be managed. HR professionals often ask themselves how we can maintain our compliance obligations, without being a roadblock to the success of our organizations. There are 6 non-negotiable areas of compliance that have to be incorporated to your daily operations. You must embrace these and be able to navigate the leadership team to embrace them as well. Utilizing a proven system of process, management and communication, it is possible for HR Departments of One to attack it all and be a partner to the business. Concluding with action-oriented steps and an effective method of securing the resources needed to move initiatives forward, we will be sure you leave the program with the tools you need to get it all done. Sole member HR departments are saddled with administrative tasks, while they often have the desire to participate at a more strategic level. The executive team expects you to have CHRO depth of knowledge, the employees want answers to their question now. Finance wants benefit bills yesterday and Operations needs new candidates. How do you navigate to meet the needs of all your internal customers and still get your job done? Learn tips from a former sole practitioner and consultant to small businesses. Lori shares practical real-world advice to get control of your day and shine in the HR function. Mastermind, or peer-to-peer advisory, groups are found in all aspects of development today. Some team members participate outside our organizations but bringing them into the organization helps maintain control and achieve the development, engagement and succession planning goals for your team. Internal talent development professionals are utilizing this format in house as an effective new avenue for learning and development activities. Well formatted and facilitated mastermind groups can build skills and camaraderie within teams, increasing employee engagement. At the same time, they will provide access to resources that might otherwise be unavailable to employees not in current leadership positions. But how do you get started? Using proven techniques, participants will learn about the basics of the groups, how to get started, facilitation techniques and other process that help you get started. We will look at technology as a way to deploy the programs throughout the organization that makes facilitation easy. Businesses today operate in a VUCA world (Volatile, Uncertain, Complex, and Ambiguous). Organizations and employees are doing everything possible to keep up, but the days of going off to a strategic planning retreat, planning a 5-year vision and executing it are gone. In this 30-minute webinar, we'll discuss what leaders of organization and HR must do to adapt to this new and ever-changing world of competing business priorities to ensure continual success. We will identify what causes a VUCA environment and how you can identify where your organization is on the continuum. I'll provide valuable tips to address each situation - whether Volatile, Uncertain, Complex, Ambiguous or all 4. Specifically for HR, we'll review the common needs of today's workplace and give tips and suggestions to help align HR with the changes in the organization, ensure that you gain the resources you need, and establish yourself as the visionary team member that is helping to drive your organization forward. Managers lose a key member of their team, and the first thing they do is rush to find a body to fill the seat. Recruiting may be the single most important function of an organization, and it needs to be given the care and attention it deserves. Through our interactive program, we will looks at ways to create a never ending candidate pipeline, interviewing techniques for successful selection and evaluation methods that can ensure success. Resources will be provided to allow you to implement new aspects of your programs today. Ready or not… it’s 2019! Is your HR department ready? Start the new year off on the right foot with a checkup of your HR compliance obligations and a review of HR best practices. During this webinar, we'll help to ensure that your documents are where they need to be and that the right policies are in place to support your requirements and culture for the new year. • What belongs in employee files - and what can you just get rid of! We'll also cover what is coming down the pike for 2019 and how to get ahead of any changes. CEO's are focused on long-term success - and the needs of your employees should be too. But how do we know what will impact our organization in 15 years? Business futurists are consulted to predict where trends are going what savvy organizations need to do to complete. Social, environmental, and global issues are touching all businesses today faster and with more impact than ever before. 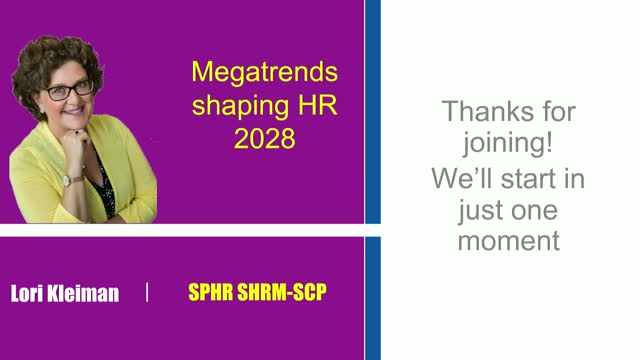 HR departments have to get ahead of the megatrends that are facing their businesses and anticipate trends. Explore the top megatrends CEO's are watching for the next 15 years, and determine how you can implement these to focus your human resources initiatives. Megatrends will change your business in the next ten years. Don't miss this opportunity to get ahead of the curve an bring the latest thought leadership back to your organization. Recruiting has to be more then just filling a vacant position – and retaining top talent is all about making the right selection to begin with. Managers need to look at the scope of the role – and how that may have changed since the last person held the position. What do they really need in the future…and how can succession planning be impacted by hiring just the right person. Candidates look for jobs in a new way, and the tools available to managers to screen candidates should be utilized. Technology can be a huge time saver in communicating with and evaluating candidates. Tools in background evaluation and personality assessment will be reviewed to help managers determine which are appropriate to bring into their recruiting process. We will provide participants with recommendations to determine starting salary and the proper preparation of the offer letter. Finally, our discussion will conclude with the tools to identify top talent and ensure they are aligned with the long-term success of your organization. You don’t want to be the next company on the evening news! But if employees don’t know the basics of identifying and reporting harassment how can we expect them to follow your procedures. We will cover the basics you need to include in Anti-harassment and discrimination training, how to engage your audience and the legal compliance pieces that cover the responsibility your business has. If you are working in a company that expects you to be responsible for this with little or no budget for external training – this is the program for you! Leadership in human resources requires an understanding of the strategic initiatives and the ability to align organizational talent with success. Planning for the future needs of human capital is a key component to success as an HR executive. In this action-packed program, we will look at performance management through the lens of strategy and executive interactions. Attendees will walk away with an understanding of what to look for in a strategic plan, and how to craft performance discussions to ensure only those that are headed in the same direction as leadership are considered top talent. We will review an HR Topics proprietary tool that helps organizations evaluate who is really top talent, and what those individuals might need to move to the next level. Finally, we conclude with recommendations of how to incorporate changes to the performance conversation into the organization and impact a culture shift that will drive results. Compensation is often the highest line item on any organizational budget. But do your employees really understand the value they receive from you - which goes WAY beyond their paycheck. We will look at the components of compensation that you should be talking to your employees about - and then easy ways for you to create statement in house without a lot of cost or trouble. Options are provided for external resources as well. HR certified - extra bonus, 1 SHRM or HRCI credit for attending! Leadership in human resources requires understanding of the strategic initiatives and the ability to align organizational talent with success. Planning for the future needs of human capital is a key component to success as a HR executive. In this action packed program, we will look at performance management through the lens of strategy and executive interactions. Attendees will walk about with an understanding of what to look for in a strategic plan, and how to craft performance discussions to ensure only those that are headed in the same direction as leadership are considered top talent. We will review a HR Topics proprietary tool that helps organizations evaluate who is really top talent, and what those individuals might need to move to the next level. Finally, we conclude with recommendations of how to incorporate changes to the performance conversation into the organization and impact a culture shift that will drive results. United States HR teams are pulled in different directions every day. Staying on top of the human resources activities can be complex enough, and compliance must be managed in midst of all of it. There are 6 non-negotiable areas of compliance that have to be incorporated to your daily operations. You must embrace these, and be able to navigate the leadership team to embrace them as well. Lori will share effective method of securing the resources needed to move initiatives forward, you will be sure you leave the program with the tools you need to get it all done. You don’t have to figure it out on your own - join us and get a quick path for 2017 compliance now! Employees are the backbone of every organization and managers know that. When the focus is on getting new customers, creating new revenue streams, making a profit and being innovation - who has time to make employees happy. Aren’t they here to do a job anyway? Well yes, but they still need to know they make a difference. In this program, we’ll look at how happy employees can support your corporate initiatives and actually give you time back. And, it can all happen with minimal effort and budget. Recruiting has to be more then just filling a vacant position – and retaining top talent is all about making the right selection to being with. Managers need to look at the scope of the role – and how that may have changed since the last person held the position. What do they really need in the future…and how can succession planning be impacted by hiring just the right person. Candidates look for jobs in a new way, and the tools available to managers to screen candidates should be utilized. Technology can be a huge time saver in communicating with and evaluating candidates. Tools in background evaluation and personality assessment will be reviewed to help managers determine which are appropriate to bring into their recruiting process. We will provide participants with recommendations to determine starting salary and the proper preparation of the offer letter. Finally, our discussion will conclude with the tools to identify top talent and ensure they are aligned with the long-term success of your organization. At HR Topics we provide useful and actionable tips and advice covering all areas of human resources. Whether you are an HR Department of 1 or 100, we provide valuable information you can use to run a more efficient and compliant HR department.